In the Thuringian Forest, in the free state of Thuringia, Germany, people have started to tell tales of a strange horned rabbit called the “rasselbock.” This creature looks exactly like a large rabbit with antlers and fangs. The rasselbock is said to be shy of humans, and most active at night; their eyes and whiskers are especially adapted to working in even the darkest conditions. During the day, they sleep in caves or dense thicket. The regional museum of Sitzendorfer, a town located in the Thuringian Forest, has several stuffed specimens on display. On May 1 each year, the town celebrates the “Rasselbock Festival,” which features dancing, a farmer’s theater, a colorful market, and, naturally, a rasselbock hunt. 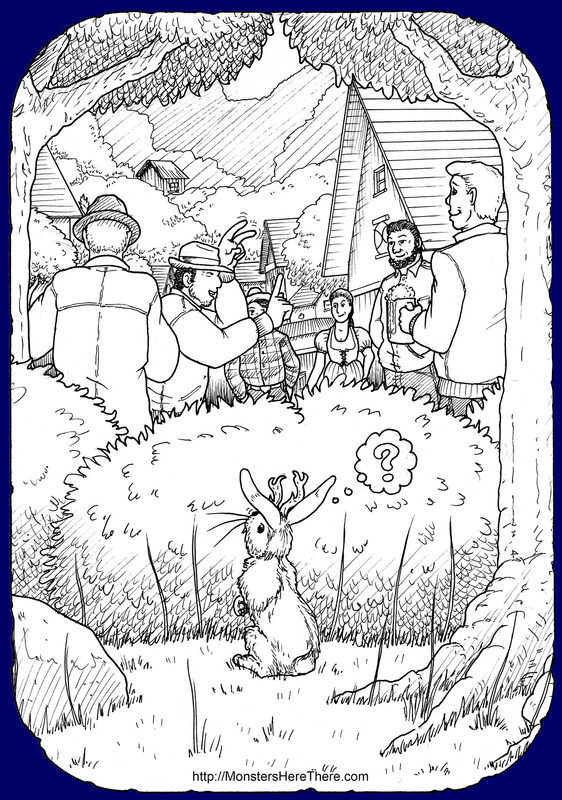 Unfortunately, it’s pretty clear from even a brief examination of the rasselbock stories that they’re pure fiction, based on the popular American monster called a “jackalope”. In the 1930’s, two brothers from Douglas, Wyoming, combined a stuffed rabbit head with some deer horns, and dubbed the result the jackalope. The whimsical creation proved popular, and now Douglas celebrates yearly with a jackalope festival... which includes a jackalope hunt. Sound familiar? Still, it’s all in fun; so be sure to ask about the rasselbock if you ever visit the Thuringian Forest! Sitzendorfer Porzellanmanufaktur: Rasselbockfest, 2008 website for the town of Sitzendorfer in Thuringia, Germany. Online: Click here! Sitzendorfer Porzellanmanufaktur: Touristic Rasselbock, 2008 website for the town of Sitzendorfer in Thuringia, Germany. Online: Click here!